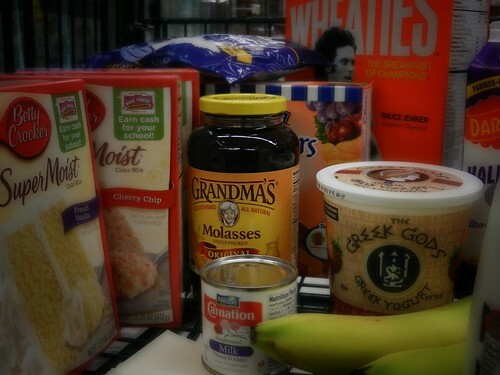 I’m sure the shoppers around me wondered what was so remarkable about the contents of my cart that would merit a photo. I’m also pretty sure you’re wondering the same thing. Three-for-$4 cake mixes? Bruce Jenner Wheaties? Those are cool, but it’s the molasses. For the cookies I promised to bake (and mail to Iraq) for Taylor’s birthday. Last September. I think that puts me in position to win this year’s pitiful-mother-of-the-year award.